Wedding card maker software designs colourful marriage invitation cards in your own style using various image designing tools. Wedding card maker software facilitates to invite your friends, colleagues, relatives and various other people with your own designed handmade marriage invitation card. Wedding card designing software provides readymade templates to design your own marriage invitation card regardless of being creative. Marriage invitation card maker software facilitates to design wedding card of any background, size or shape using image designing objects. Card designing tool creates wedding cards with option to email designed cards on user specified email address. • Batch Processing Series: Wedding card software design multiple wedding invitation cards using batch processing series option. • E-mail Setting: Wedding card maker software provides email settings to send designed cards via email. 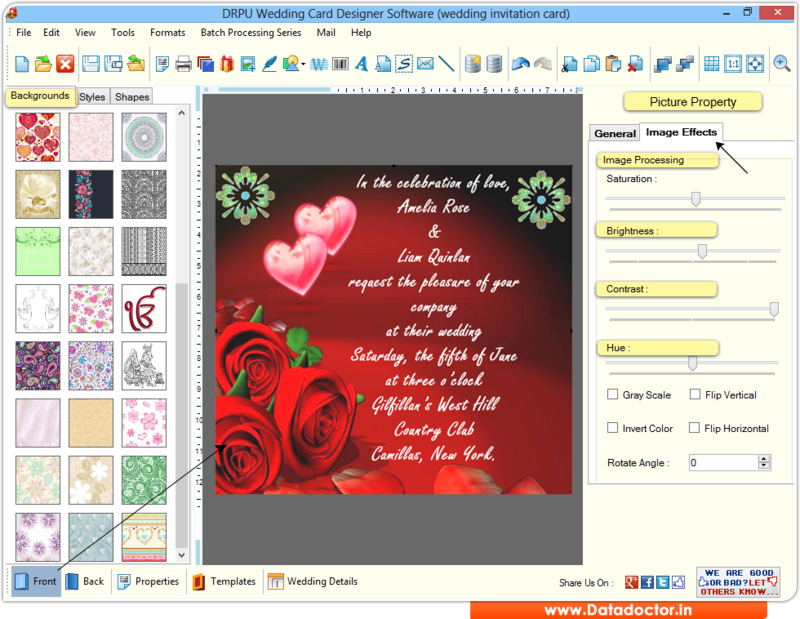 • Print Setting: Wedding card creator tool facilitates to print designed marriage invitation card. • Advance color and background settings: Wedding card designing utility provides inbuilt color and background settings to create colorful wedding cards. • Creates invitation card using templates : Wedding card program provides wide-variety of predefined templates to design customized invitation card. • Option to save designed Wedding Card at user specified location.